"Uganda must find the kidnappers of the American tourist and guide before people will feel safe in going there. Bring them to justice openly and quickily," Trump tweeted. 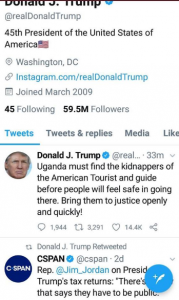 The president of the United States, Donald Trump has directed Uganda to find the people who kidnapped the American tourist and his guide on Tuesday last week in Queen Elizabeth National park. Kimberly Sue Endicott and the guide, Jean Paul Mirenge were rescued on Sunday rescued according to Bashil Hangi, the Uganda Wildlife Authority (UWA) spokesperson but details of the rescue mission and the kidnappers were reserved. However, to break the silence, the U.S leader took to his twitter to demand Ugandan authorities to arrest and try the kidnappers of his citizen with immediate effect to deter future occurrences of the same vice. He added that such acts can also discourage other tourists from coming into Uganda. “Uganda must find the kidnappers of the American tourist and guide before people will feel safe in going there. Bring them to justice openly and quickily,” Trump tweeted. The duo were kidnapped at gunpoint during an evening game drive on Edward track between Katoke Gate and Wilderness camp in Kanungu district. The gunmen left two other elderly tourists, Julius Martin and his wife Barbel, in the tour van unharmed but took away the car keys. The kidnappers who were using Kimberly’s phone, demanded $500,000 (about Shs 1.8 billion) as ransom for their release. Unconfirmed reports indicate that an unspecified amount of money was paid to the kidnappers by the tour company, Wild Frontiers.